flourish a golden year . 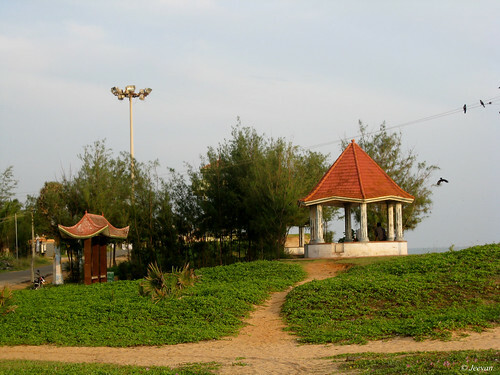 'என்ன எங்கே நீ கூட்டி போற'. What else I need more, than the ‘sea’? The poem was inspired by the 'Kadal' songs: Kadal (Sea) is a Tamil film directed by ace director Mani Rathnam and music by the Oscar winner AR.Rahman. The words I brought into the quotation marks are derived from the song lyrics, almost the first line. The songs of Kadal drive me quite merrily under pleasure and I’m listening to it every day and before heading to bed, it causes some comfort and peace to heart. slowly fall to the ground. to a kid crawling on the lap? he killed everyone to hump. P.S. A tribute to tsunami victims, wrote from a fishermen’s perspective. 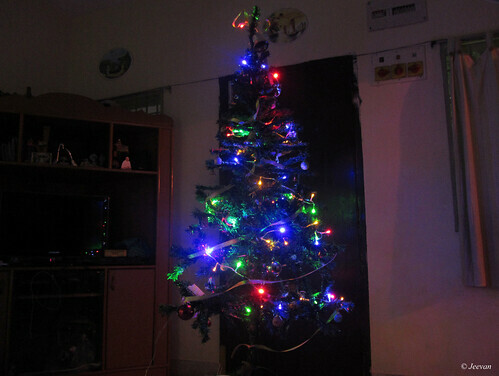 I and my mom setup this tree today, decorating with bells, balls, starts and tying ribbon and serial led bulbs. 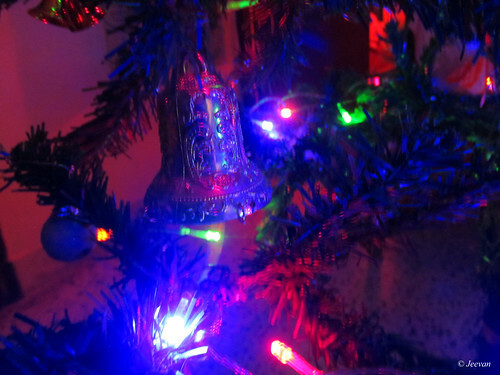 If there’s something that fascinates me always about the Xmas was the Christmas tree and sharing of gifts. 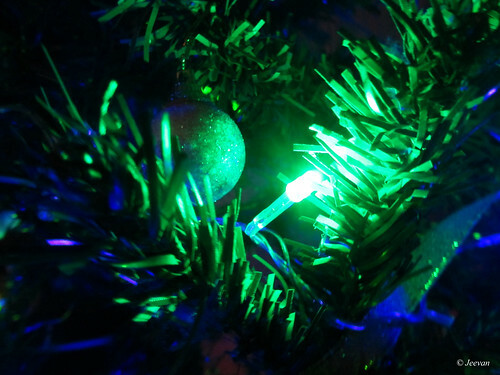 Beyond belief and religion, Christmas is a cheerful festival of perhaps celebrated by kid to oldie, cherishing the warmth of togetherness, against the cold hug of winter. I always wish to be a part of this celebration which illuminates the spirit of entire sphere. 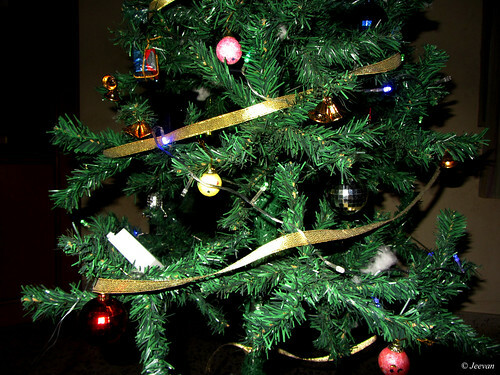 I’m tying stars for nearly a decade now and the Xmas tree was brought only last year, after put a great plea at parents. Anyhow, wishing you all a Merry Christmas and Happy New Year. About 10 in morning we were waiting at the Ooty Collectorate, on the recommendation of one of dad’s friend to get official permission to enter the Avalanche forest to led up to Upper Bavani backwaters and dam. But our bad chance the DFO had been on off-duty that day and being promised by the officers to get permission for next day, we decided to check the Mudumalai Wildlife Sanctuary which is about 60km from Ooty, which we have planned for other day. I have passed Mudumalai Wildlife Sanctuary and Tiger Reserve couple of times over visiting Mysore and one of it at night; but this was on a bright summer day last year and it was such hot as soon we climbed down the hills from the very pleasant weather at Ooty. The cold breeze was brushing us against seeking some warmth while waiting for the response at collector office, which has some tall pine trees adding some more chillness. We had some wonderful sightseeing driving down the winding road, stopping here and there for some shots and the above photo was on a small lake-come-check dam we passed and being summer, there isn't much water in any lakes or dams around the Nilgiri. While the condition on hills where like that, the plains doesn't need explain. But it was incredible hot even at Gudalur above 1000m MSL and we spent some time there getting our lunch packs and moved into the wildlife sanctuary, welcomed by an arch. A part of our drive into the sanctuary was under scorching sun and we couldn't find an animal until reaching the Theppakadu – the head of the sanctuary, where the tourist activities hold around. Since it was summer and prevailing to drought, the sanctuary was closed for visitors taking safari and staying at their forest guest houses. 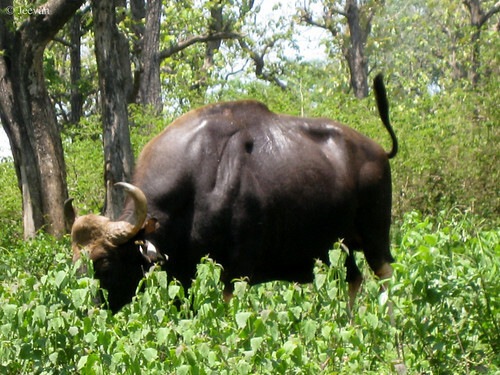 We decided to drive on the National Highways that cut across this National Park, until the Tamil Nadu State boarder and while driving back to Theppakadu we found an adult bison (Indian Gaur) climbing down a mound, apart grazing. 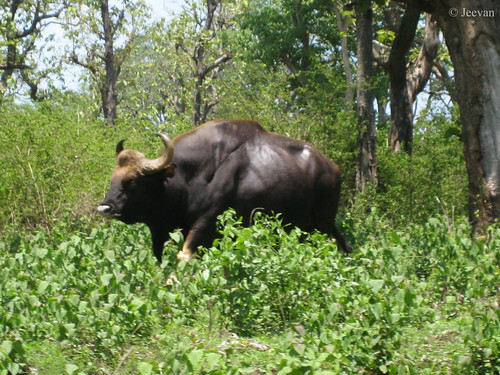 The bison moved like a boulder, imposing to muscular body. 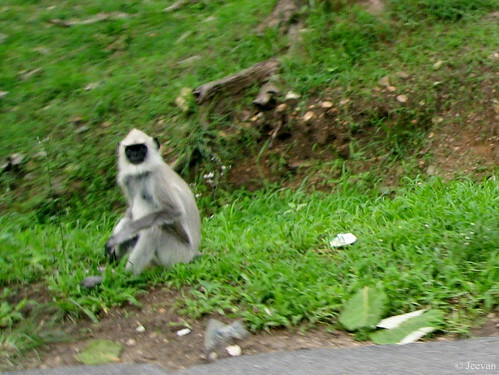 It was the only so wild animal we found other than spotted deer and Gray Langurs. 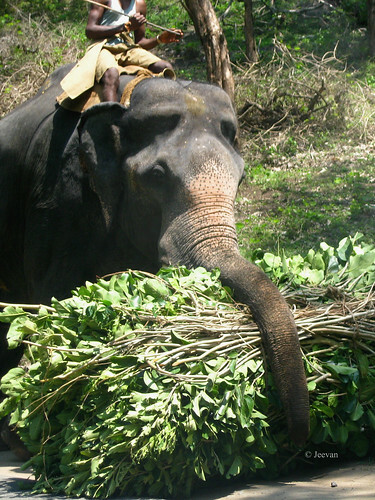 We also come across a Kumki (tamed elephant), carrying some green bushes in-between the tusk and trunk, drive by a mahout sitting on its top. During the month of Nov-Dec, the state government conducts refreshing camp in Mudumalai, which brings many temple elephants from across state to the permanent elephant camp in Theppakadu. But only this year the camp was shifted to the bank of Bavani River near Mettupalaiyam, to avoid giving trouble to elephants drive through Ghat Roads. Even the wildlife sanctuary’s safaris are closed for visitors; there are number of private jeeps available to take us around the park, by certain routes allotted for them. But avoiding them, we head to Masinagudi. My bro had been there for two times and befriend with a jeep driver, so we called him to stay up there who was on a safari and before he arrives we had our lunch on the outskirts of Masinagudi and also drive up to Singara, looking for animals on either sides of the road. Singara is where the Pykara Hydroelectric Power Plant is located, which brings water through pipes from GlenMorgan Lake at a height of about 1000 meters. I know it wasn't easy for me to board a jeep, but wished to see what type of jeep it was and convenient by chance. Regrettably the jeep doesn't show any kind towards me carrying on, unlike the jeep guide who comes forward to take us via roadways in our SUV. The wear out tires refused to give me even that chance because it may take us through rough terrain. For the back drive we took the road from Masanakudi to Ooty, which is an endanger route to drive past sharp hairpin bends and road climbing steep. Initially we took this route way back in 1997 to reach Mysore, unaware it’s endanger then we never took it later and only this time that too for climbing up and not down. The friend who drove the car was an experienced one and has been taken this route early once, decided to make a very careful drive and safe passage. We stopped at the Kalhatty fall and checked the view point, which shows nothing but a tract of wet rock. Before heading to Kotagiri, we made a visit to my friend’s house at Ooty and he being busy with his house under whitewash, we couldn't spend much time and also needed to check with officers at Collectorate about our next day visit to Avalanchi. Gladly we got the permission from the DFO, who was back at office in the evening, it was very exciting how the day gonna break tomorrow leading us to road less travel – which is another venture, for another day to share with you all. Expectation is something we can’t avoid, however; even we get frustration sometime going overly anticipating. So was a film was wonderful, the anticipation happens robotically towards the filmmaker’s next venture and there’re only few in the film division whose makeup lives up to the feeling and enhance and embrace close to the heart. From the time the movie was entitled, the anticipation began; since the movie is based on things I’m passionate about – nature and wild, how can a tamed elephant story become exception? Kumki is a Tamil name for the captive, trained Indian elephants that are used mostly for taming and training of newly captured wild elephants and also to lead away wild elephants that stray into human settlements. Prabu Solomon, the director of the late fascinating film Mynaa has come up conjoining nature and music side by side, comprising romance and thriller leading the movie to emotional core. Set in a tribal village, which faces the stroke of wild elephant and lose of lives hires a trained elephant to tackle the tusker that threatening their lives and livelihoods; the mahout who falls in love with their tribal girl decided to stay there with his show elephant, which doesn't trained to combat a wild elephant. But how come he manages all in spite of love and venture on tusker; embark on an adventures ride. The grandson of Sivaji, Vikram Prabu doesn’t let down the pride of greatest actors of all time, portrait as mahout perfectly, conveyed almost inherent of the character that distinctly noticed. Being a debut actor, his unfamiliar face is plus and Lakshmi Menon strikes through her cute expressions even expose to tremble, beholds a perspective native tribe women. The film was throughout fascinating and Thambi Ramaiah does a mainstream humor and character vise manipulate. The head of the tribe village is also a notable character. 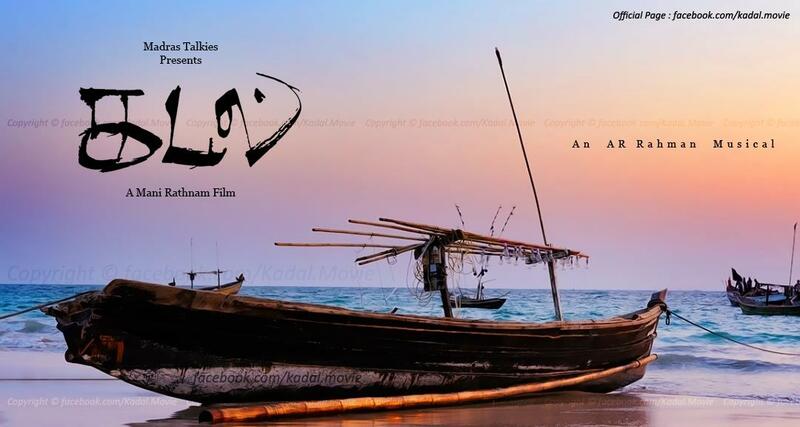 There’s a lot to experience in the film which visually treat and sound track creates a vibrant and alive moments esp. the Jog falls sequence was stunning and an ever seen scene shot on the screen. Terrific! I really need to mention about Music, which is the heart beat of the feature film and songs are quite intimate with the scenes and no where it feels off track or disjoined. The scenes related to elephant destruction and battle are created through graphics; but the way u look into the screen will animate and the real elephant Manikam was truly admirable and being the largest land animal, its behaviors are very childish and creates a sympathy over its disposition. light at the end of uterus. the motion of the immune. a process that remains mystery. than living among the relentless. Destination based travel is not my intention but many a time our travel happens around a point of destination, perhaps it’s the way the world chose to lead so and for me, a long distance travel couldn't be solely intended. 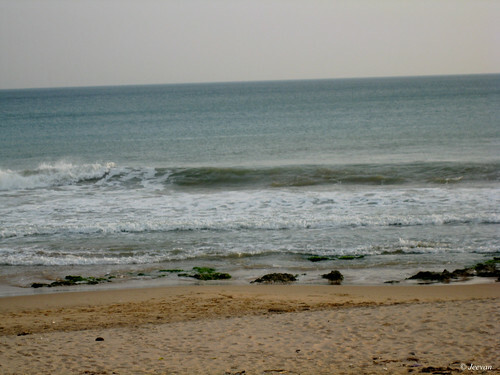 During my year old visit to Kanyakumari, the southern tip on Indian peninsula, I explored a place isolated from rest of the world view or only few more experienced; a pristine beach with foot imprints clearly visible across the wet and dry sand shore. Passing the Manakudy – a fishing hamlet on the west coast of Kanyakumari, a narrow road leads alongside the sea and elevated from sea level, the roar of waves were clearly resonate and sounds terrific each time it raise and fall. 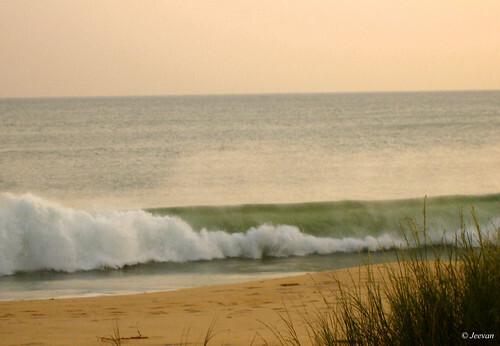 I hear from a passerby, that waves in Kanyakumari are usually rage and after tsunami its tendency has been disposition. Even the usual sight has been terrific; I couldn't image a giant wave like tsunami cut through the hamlet, with array of houses facing the sea and I also wonder what a life it could be to wake up and sleep expose to stunning sea. 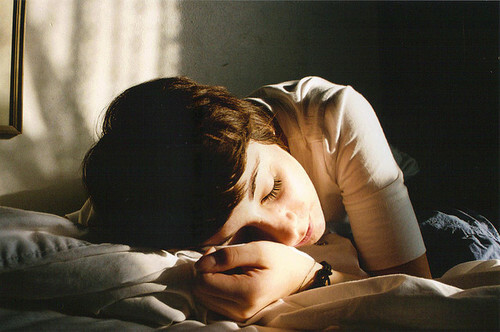 That sometime sing lullaby and identically cause shivering while sang through murderous rage – Kolaveri. 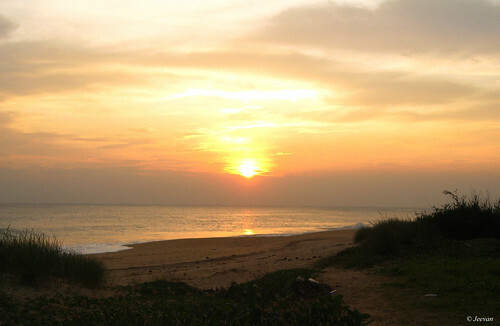 The Chothavilai Beach is about 12km from the sacred town – Kanyakumari, and it connects only through an iron bridge near the mouth of river Pazhayar, across Manakudy. 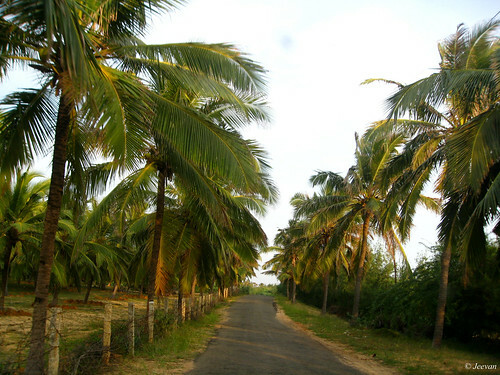 The road after the hamlet takes us to the early stage of ECR (east coast road) near Chennai, passing the casuarinas and green palm trees; the beach resembles one of the private beaches off ECR. The beach seem to taken into promotion in latter years and there were few shelters and concrete umbrellas beautifying the beach front and esp. the Japanese style of roofs shelters were impressive. But lack of maintenance left few of the statues to damage. There were only half a dozen people left ashore including a couple and their kid, the sea looked quiet vast except solo waves crush the shore every few seasons. 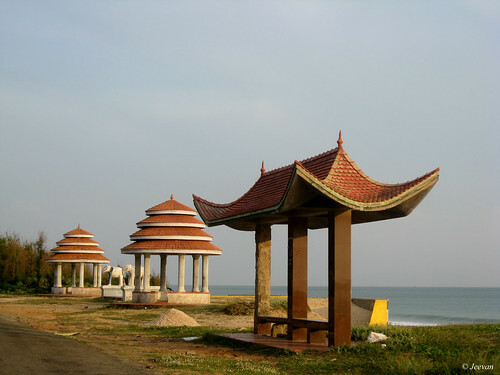 The beach holds a pretty arch, carved with number of sea species and shells, and a watch tower to check sunrise and set. Since evening, we had a glimpse of sunset and first time on the Arabian side, the sight of sunset on sea was fantastic. Even after sunset, there was much light across the sky and as we move toward the town, the sky showcases different kinds of hues and shades, fascinated while it changes its scene from one another. 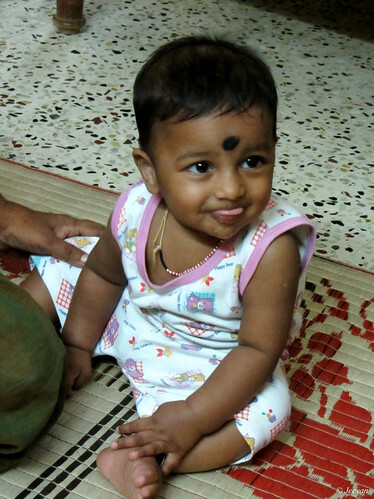 The other day my nephew (Barath) came home and I had a wonderful evening along with him, admiring his little attitudes and gestures and he had grown well now being an eight month old to turn and take quick crawl to grasp anything. I first and last saw him as a four-year-old and he still hold the charm but more delightful, the kid’s each move behold my attention and he’s very clever at expressing his cute expressions and emotion. Here I share another set of photos I captured during, falling in love with his enormous joy and he’s someone unlike any other child and being the youngest generation of ours, eliminates anyone cherished so far. I see a special spark in his blissful eyes that feels like no one ever behold, and his wide and watchful eyes were one such remarkable. He’s my favorite cousin’s son of childhood and being with her were the days the most wanted and delighted. But things were different now and everyone exists into our own sphere, but the past could never resemble again. The priorities might change but I believe the attitudes remain. before awake from deep slumber. sun sparkle like a diamond. dreaming ideally under the sun. passes through a silent ringtone. 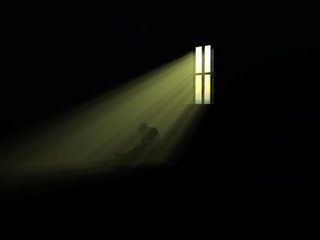 Man, men/women really needs some rest or rear seat ride sometime in progress of life, however serious we take our journey without some break life becomes tiresome and thinking overload sent to mental tragedy or disorder. This is not something new I am says, but the problem related to it shows many graphical sign boards these days and each hour becoming rush hours, there’s no time or least for relief and relaxation and whatever the occupation might be – IT, industrial or farmer, long working hours or days produces abundant stress. Why I think about this because, one such prolongs hard work and mentally stress sent one of my mother’s aunt to oblivion and become so insane, which had led her to death yesterday. She is one of a kind hearted whose stretch is immeasurably in exposing love and affection towards others and a great hard worker and since being a farmer women, she always work into the fields and drive the cattle to graze every day. Not more than age of 60, she lost her consciousness almost lately exiting from the symptoms of childish and forgetfulness in recent past or less than 4 years – when I last saw her, they said that it’s all because of her contract brain, perhaps due to prolong working under the sunshine and greatly depressed. I always love visiting her home in village near Thiruporur and you don’t need a reason because, village means a lot to me and I believe they are the unlimited source of living and there isn't a place like village, beautiful as well touch with lives. We occasionally visit their village during summer and mattu Pongal, in the company of my cousins; we enjoy spending the day partially at their fields, near the lake and pump-set – one of the fascinating things of village and fun indeed. I haven’t taken bath in their pump-set, but that used to be nostalgic observing things happening around and recollecting memories of childhood where I used to be active on the front. What really bothers me was that we only visited her on a previous Sunday and this Sunday she’s no more. See how life become too shot and she wasn't physically ill to die, but lose her track to slip into a pond near her home at the early hours of morning when no one was wake up to see. I heard they searched for her everywhere and only by evening they found her lifeless body floating on the pond, it was really a tragedy and when we visited her on Sunday, she couldn't identify anybody and kept coming around their home. 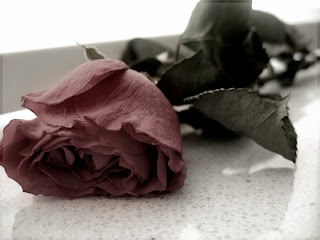 Mom was very glad that she could visit her before she expire, even she feel sorrow for her early death. Mom used to be her favorite child to visit her often during childhood which she always cherishes, telling to me. She survived by two daughters and sons, and both her daughters were married at age above 30 when she was nearly losing her conscious, and it seems that the main cause for her depression was postponing of her elder girl’s marriage – who being a dark skin holder, many refused to marry her. But I should appreciate her courage, even though many eliminate her she stayed strong and their family was very supportive and there was a togetherness between the siblings which seldom seen anywhere. I hope her early departure is also good, so that she doesn't need to face discriminate and reckless treatment imposed by society and circumstance. Hope her past seize their dear ones memory forever. 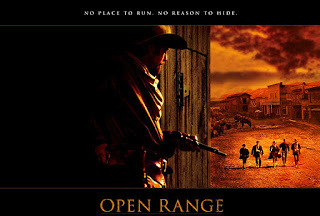 Open Range is one of the finest western films I watched yesterday, filled with fascinating sights and sounds; and the beauty of the western landscape was captured brilliantly thought the stunning cinematography. Ever so simplest story and screenplay, each characters proposes decently either and unlike any other cowboy films I watched, nothing were well-built like this and limited to significant action and gunfight. Boss and Charley are the two main characters of the movie, taking avenge for killing their co-cattlemen and badly injured another; arrive at the nearby town waiting for the right moment to capture the marshal to put into the jailhouse and encounter his gunmen’s. There’s a mild and matured romance between the Charley and Sue – the sister of a doctor, who took care of the wounded cattlemen. In the absence of special effects and graphics, the film engrosses and enhance through the raw and simple emotions; and the setting of the town is at base, but the conflict between the gunmen and town people were unlike bewildered. Glad the movie came up with 5.1 channels, emphasis the dynamic effects of theater and recreates a feel of live esp. the sound of battle, rain and thunder rocks! The film released in 2003 is based on the novel ‘The Open Range Men’ by Lauran Paine and was filmed around Alberta, Canada. The film was produced, directed and lead by Kevin Costern. 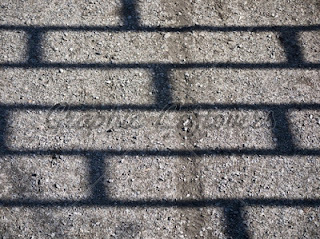 It’s always exciting exploring a place, where the road less traveled and not many foots imprint the soil and cameras stole the scenery; an environment rich in flora and fauna as well pleasure where not many virtual developments take place. 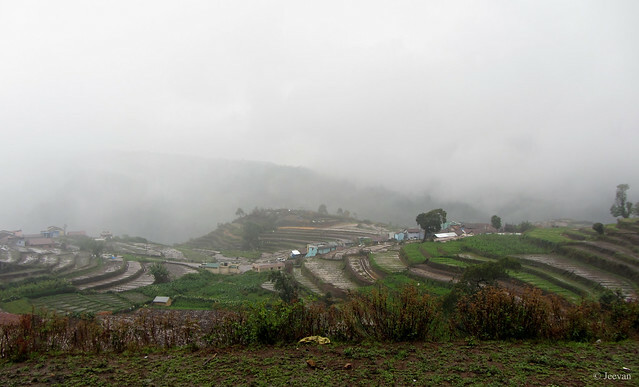 Remote from the tourist sight and protected by nature, Kukkal is not so far from the crowded Kodaikanal, the hill station that losing its spirit and pristine beauty unprotected from becoming a quite concrete jungle. 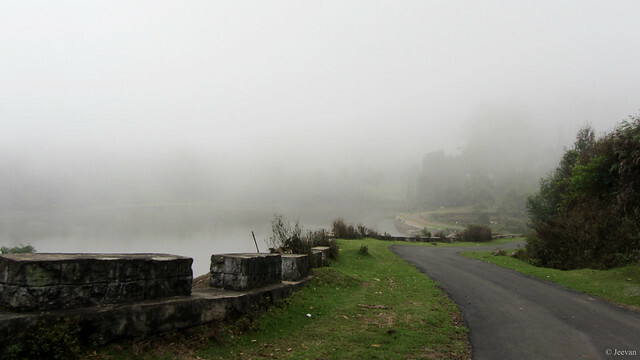 During my vacation at Kodaikanal, last summer, I explored this little paradise called Kukkal or Kookal on the Western Ghats Mountain range of Palani and about 32km from Kodaikanal; the place is so blissful with tranquilly lake and sleepy village atmosphere, comprising shoals and grasslands adjoining the terrace farming. 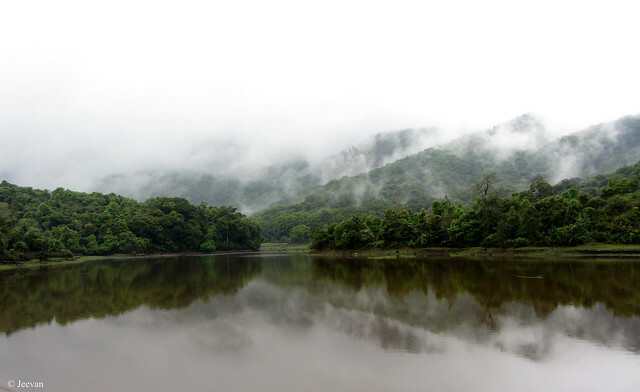 Nestled near the northern ridge of Palani Hills, Kukkal is notable for the high biodiversity of the area and fascinated by frequent mist and rainfall, which account for large variations over short distance. Riding on the Poombarai road after certain distance, the mist began to block our way, delighted as well become obstacle going through its dense and even I have travelled on this road once, I’m only familiar with its route map in Google. :D We were traveling on two cars and since I only know where to turn, my uncle left our car to first go – even he was to Kodaikanal many a times, never know this place until I located. The road to Kukkal is a narrow one, turning on the second left from the road to Poombarai village; the tar road seems relayed by rusted leaves and tall trees standing besides as festoon and green pastures enticing the sightseeing. The road winding down near the Kukkal Lake was very beautiful; alongside the view of the mist floating over the lake was awesome… The lake is the main stream source of the cultivation, even though it doesn’t look clean, but with overall sight of mist and mountains background it was astonishing! Well I don’t need to say much of the lake, since my photo captured it all to you viewer’s amusement. There was a Little Grebe swam across the lake leisurely, creating mild ripples tracks which I thought first to be caused by some insects, but only later zoom in on I realize it was a small water bird ‘Dabchick’. I spent only a brief moment on the power wheels (chair) moving on the Lake Bank or road, the mist turned abundantly gray began to rain nonstop leaving only few minutes gap before we leave the place. My cousins, who tented on the green patches opposite to lake, couldn’t withstand the density of rain and leakage in the pretty blue tent forced them to take their seats inside the car, whom enjoying the pitter patter of rain and warmth inside the tent. 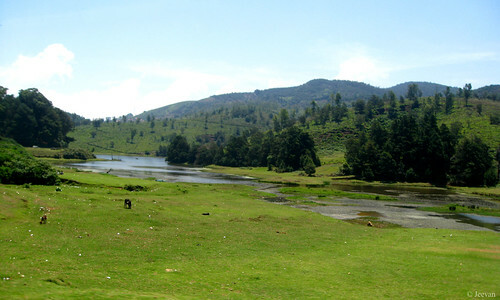 The lake located in a valley, has cultivation lands from its lowest to higher elevation; and except the monsoon, the terrace farming happens with the catchments of shoals around the lake, which is also a basin for Kudiraiyar River that flows through Kukkal. We rode few meters on road above the lake to check the Kukkal village; even while it was raining we tried to get a glimpse of the village that taking a nap under the mist blanket. Since being an afternoon, there was no one around to receive us but the stair cultivation and its texture were amazing, and I feel glad seeing them very close unlike the distance views of Poombarai and Mannavanur. following the fall of sunlight. 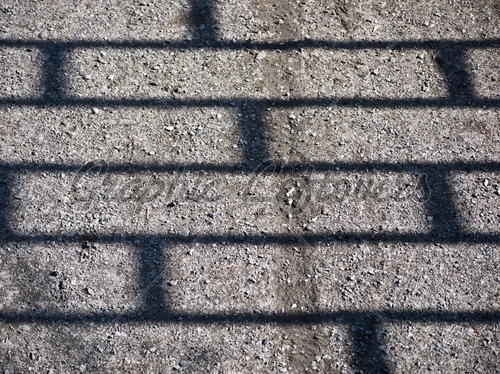 tracing the light swallowed by shadow. reflected through a mirror of Wagon R.
I wish to travel a lot during this month and the dew dawn is never refreshing like anything esp. for me and if there’s a choice I will choose this month to explore places on surface and even breathing the tremble cold of hill stations. There are few travels I took during this month are most fascinating in my rides and my first time to Valparai in Dec 2008, near Kovai or Coimbatore is rejuvenating even thinking now and almost riding around the pristine mountains and stunning country sides of Pollachi and Erode is evergreen. Last year on the same month, I was around the southern tip of India –Kanyakumari, enjoying the simple stay and travel among the wind energies and roaring rock waves with settings of sun and nip in the air were appreciably. On our way back, climbing the Sirumalai (Small Hill – which isn’t very small like the name refers) on the Natham-Dindigul main road is fascinated by its quite tranquility and rich in small banana plantation, the cold wind will enforce you to hold embrace even there was bright flash of sunlight and the couple of villages or colonies as they mention there inhabited to horseback packed products grows around the hills. 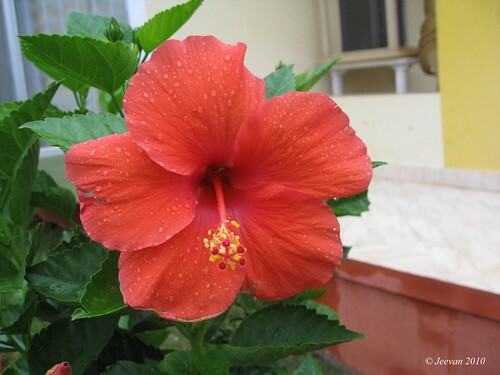 The December has something distinct feature as fragrance, stretching both the wings of hot and cold and the real odor of it could be experienced only in villages, while they produce smokes in evening to warmth as well driving away the mosquitoes that breed mostly in this month or season, after rain. The cow dung smell was something enrich during this time, where most of the houses are swish swashed to cow dung sprayed on the courtyard before drawing a beautiful Rangoli or Kolam (a design created by using flour) to flourish their homes, which is a tradition followed esp. during the Tamil month of Margazhi – which begins at the middle of December. The music and dance has been great conjoin to December, where many a concerts and dance festivals hold everywhere across Chennai, I have no idea about the vibes it creates, but hope it has something wonderful, only those passionate about could express right. 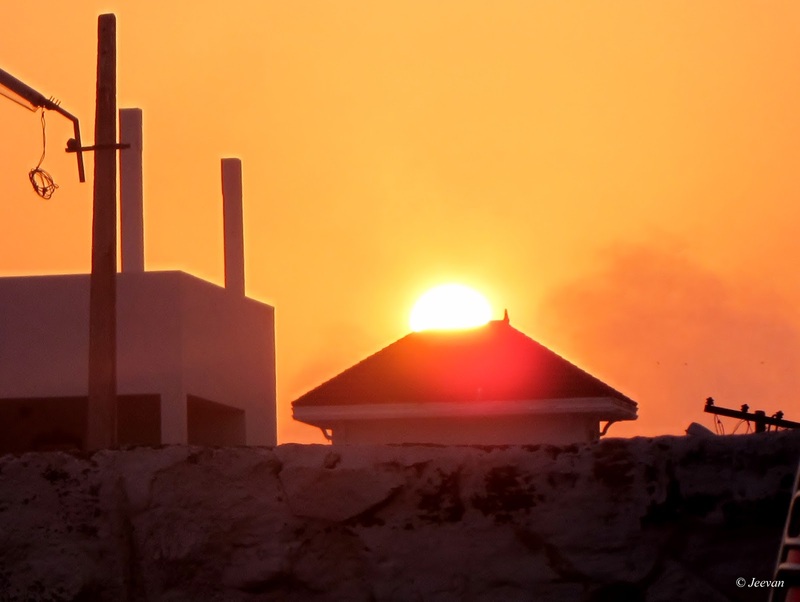 Overall, the December has an enchanting climate unlike any other month or season; I too believe each season/month has its own essence to cherish; the December has a distinct sky with glorious setting of sun, which I well observed during my Kanyakumari visit.